We are happy and excited to serve up the highest quality products available, at an exceptional value. Our goal is to accommodate your uniqueness by offering alternative choices such as vegan, dairy free and gluten free options, in addition to our traditional favorites. Environmental responsibility is at the heart of our business. 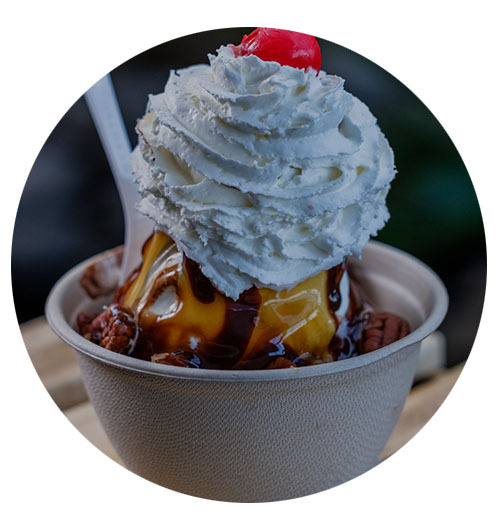 Bliss Ice Cream works with local vendors and distributors whenever possible and chooses products that have the least impact on our eco system. We have intentionally and thoughtfully placed great effort into our packaging and use 100% compostable products. In partnership with the Onondaga Composting facility and Natural Upcycling, we are able to compost over 60% of our discarded materials. This allows us to recycle the majority of what remains, leaving minimal items diverted to the landfill. Bliss Ice Cream is honored to partner with a Syracuse hometown favorite; Gannon’s Ice Cream. We offer a variety of Gannon’s premium hard ice cream flavors. Working with Gannon’s aligns with our appetite for the highest quality ice cream available while keeping our focus on local products. Temptation Vegan Soft Serve is an all-natural, dairy-free, Non-GMO ice cream. Temptation has a remarkably smooth texture and rich flavor; an unexpected dessert without compromise.